We are excited to announce a kickass event! Buy online at Hold My Ticket until noon day of event; tickets also available at door at the ArtBar. Pyragraph—the first and only creative career & lifestyle magazine, based in ABQ but read by creatives worldwide—is giving our site a tech upgrade so we can bring you even more excellent content. A celebration/fundraiser is in order! 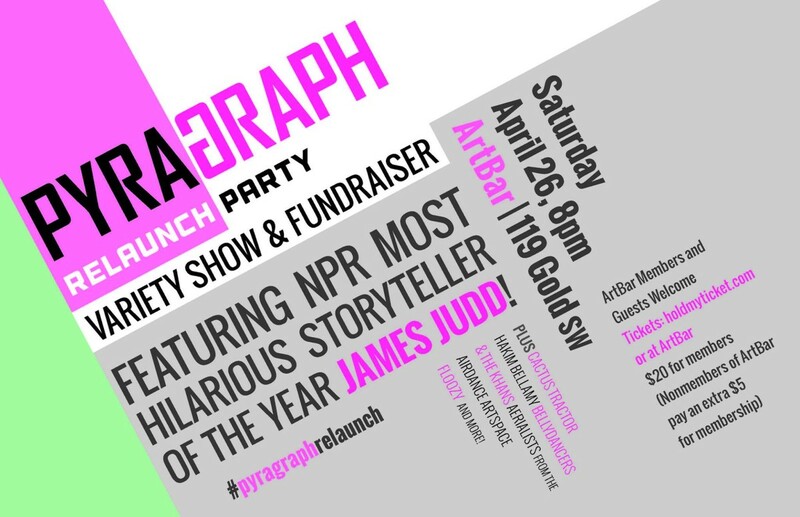 We’re thrilled to feature NPR Most Hilarious Storyteller of the year, James Judd! James is a monologist based in New York City. Monologist is a two-dollar word for storyteller. He’s also the first ever Artist in Residence at the prestigious All For One Theater, which produces an annual season of solo works in Manhattan, and is the recipient of the 2013 Award for Outstanding Actor in Short Subject for Funny Stories at the Midtown International Theater Festival. He is currently touring his newest play Killer Quack in advance of an Off-Broadway opening in February, 2015. See a clip of James in action below, and buy your ticket now to see James in Albuquerque! Cactus Tractor | Hakim Bellamy & Ken Arkind | Bellydancers with The Khans | Aerialists Monica Demarco and Christina Cavaleri from AirDance ArtSpace | Floozy | Sage Harrington | AJ Woods | Kyle Ruggles & Kevin Herig | Hurdle | +MORE! AND: T-shirt Transfer/Decal Station by A Good Sign | Prizes/Giveaways | Smashing Good Times! Tickets: $20. ($25 for nonmembers of ArtBar, which includes membership.) Buy online at Hold My Ticket or in person at the ArtBar. Special thanks to sponsors 516 ARTS, A Good Sign, Update Content, Tractor Brewing Company, Zendo, 10 Drink Minimum.